Seems reasonable enough to me. With the pressure from the Tevatron gone, it is not critical to squeeze every bit out of the machine. Hence the decision to remain at the 7 TeV center-of-mass energy of collisions which increases the chances that the thing will not explode in our hands again. More importantly, the run-1 is going to continue until the end of 2012. By that time, the LHC should have acquired some 5 inverse femtobarns of data, maybe more. This will be enough to see glimpses of new physics, provided there is anything below a TeV. But the most solid advantage of extending the run-1 is that the Higgs will be discovered earlier than in the alternative scenario with the 2012 shutdown. Thus, the minimum plan should be accomplished by the early 2013, if only Higgs is where we expect him to be. The disadvantage is that for 5 more years, rather than 4, I'll have to listen to talks about supersymmetry. 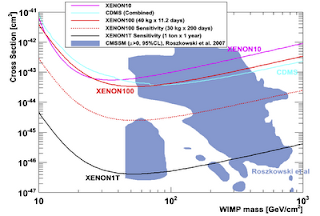 For a more illuminating analysis of the Higgs prospects, see Tommaso's blog. The year 2011 begins with an earthquake. Just yesterday I was speculating what good old Tevatron would bring as this year. The following morning we're awaken by trumpets and angel choirs announcing the new CDF paper. Inside it, the 2-sigma blip previously seen in the forward-backward asymmetry of the top quark production is promoted to a 3-sigma blip. 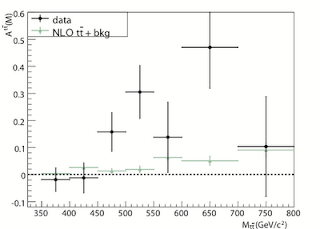 Tevatron collides protons with antiprotons, and the production of top-antitop pairs at the parton level is dominated by quark-antiquark collisions. Thus, one can define the forward direction along the proton beam (which is also the direction of the incoming quark) and the backward direction along the antiproton beam. One can then count the number of top quarks produced in the forward and backward directions, and similarly for antitop quarks. 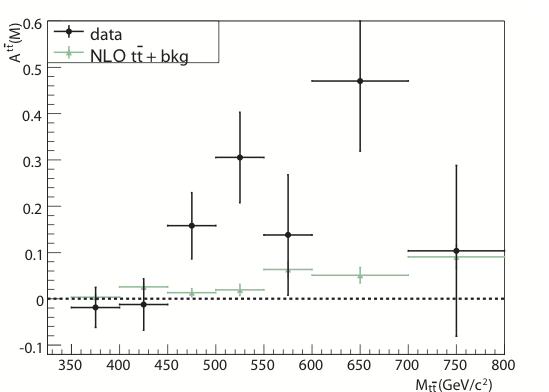 Both CDF and D0 studied this asymmetry in the Tevatron data, and found that top quarks prefer to go forward and the antitop quarks prefer to go backward. In the first approximation, there should not be any asymmetry in the standard model. However, loop corrections and jet radiation do in fact induce a small asymmetry of order a few percent. CDF and D0 were finding the asymmetry of the correct sign but a bit larger magnitude compared to the standard model prediction, with the discrepancy at the 2-sigma level. Intriguing, but not overly exciting. The new CDF paper updates their earlier analysis using 5.3 inverse femtobarns of the Tevatron data. It studies the semileptonic top events when one of the top/antitop quarks decays to b-quark + electron/muon + neutrino, and the other decays into 3 quarks. Measuring the momenta of all decay products one can reconstruct the original momenta of both tops, so that we know exactly (up to experimental uncertainties) in which directions they were produced. Furthermore, measuring the charge of the lepton identifies which one was the top and which one the antitop (the former decays to l+, the latter to l-). It is then trivial to count the difference of top quarks produced in the forward versus backward direction. Actually, the asymmetry depends a bit on the reference frame in which it is measured. 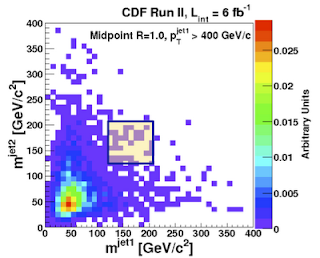 CDF give the asymmetries measured in the lab frame and in the t-tbar rest frame, and they also unfold background contamination and resolution effects to obtain microwave-ready parton-level results. The numbers quoted in the following are parton level in the t-tbar frame, while the plot relates to the same frame before the unfolding. The new key element in the CDF paper is that, thanks to improved statistics, they can study various kinematical distributions related to the asymmetry. In particular, they study how the asymmetry depends on the invariant mass of the t-tbar system (which tells you at what center of mass energy the pair was produced). While the inclusive asymmetry is small, of order few percent, the asymmetry at the high mass end of the spectrum appears to be huge, almost 50 percent. More precisely, CDF divides the t-tbar events into two groups, depending whether their invariant mass is smaller or larger than 450 GeV. In the former group the measured asymmetry is actually slightly negative, -12±15 %, perfectly consistent with the standard model prediction of 4 %. But for events with the invariant mass above 450 GeV the asymmetry is 48±11 %, as compared to 8% predicted by the standard model! The anomaly has a statistical significance of 3.4 standard deviations. The fact that the asymmetry sharply grows with the invariant mass of the t-tbar system smells like a new heavy particle meddling into the top production process. The CDF paper tries out a heavy gluon with axial couplings to the light and the top quarks. The positive sign of the asymmetry (as observed) can be obtained assuming that the couplings to the light quarks has the opposite sign than that to the top quark. 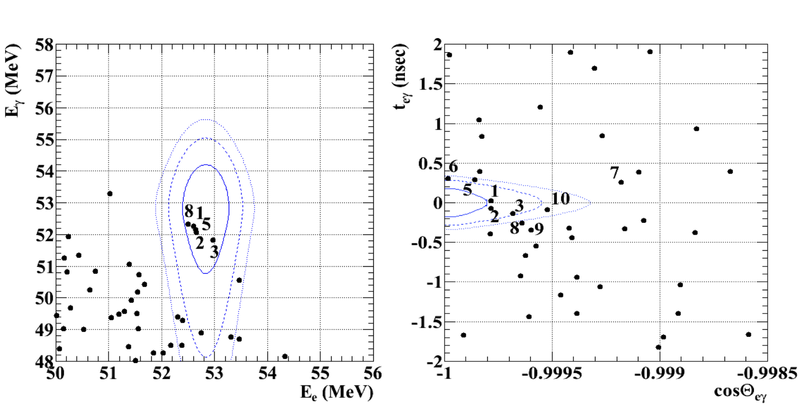 The model predicts roughly the right value and shape of the asymmetry for the gluon mass around 2 TeV (see the left plot). 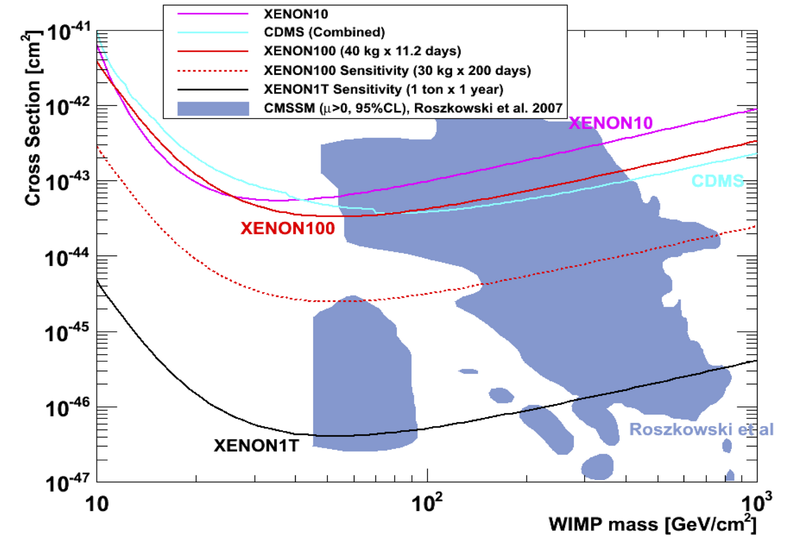 Of course, heavy gluon is not the unique possibility; other models have been proposed in the literature (Zprimes, color sextets, ...), all of them at least as ugly. 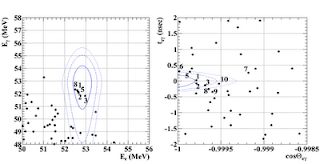 The full spectrum of possibilities will be worked out in 123 papers due to appear on hep.ph by the end of the month. As is the case with any anomaly, it is always more likely that the explanation is trivial. 3 sigma could well be a fluke. Also, some important physical contribution to the asymmetry may have been missed by theorists, so that the standard model prediction has been grossly underestimated. 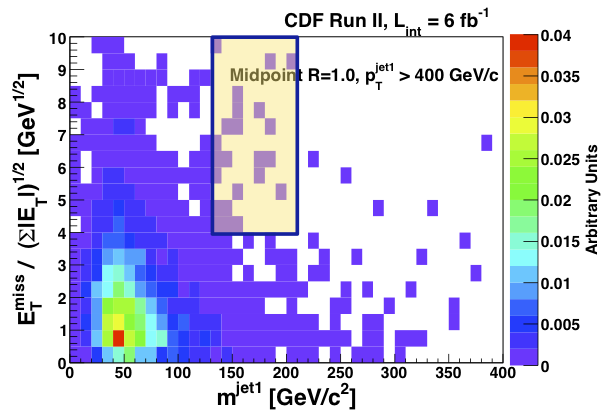 Another possibility is that CDF observed a fundon (an elementary particle produced in high-energy colliders near the end of the budgetary cycle); forward-backward asymmetry is one type of measurement where Tevatron is superior to the LHC (whose initial state is p-p, rather than p-pbar, which obscures this kind of analysis). On the other hand, if a colored particle with a TeV mass is responsible for the asymmetry, finding the particle should be a piece of cake for the LHC. Theory error, fundon, or KK gluon...time will tell. Soon.